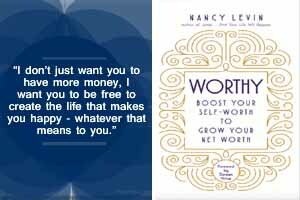 Worthy main idea focuses on “our self-worth determines our net worth.” Furthermore, not only about how we feel dealing with money issues but ourselves generally. 1) Discovering limiting beliefs, underlying commitments and excuses, 2) steps to act to eliminate them, and 3) create expansive ones to follow our dreams. Advance technical financial advice. Don’t expect information about investments, retirement funds, etc. However, first steps for financial advice are available for categories of ‘powerful decisions’ such as hiring someone, spending money, saving money, making money and handling money better. The author experience shows how an event interpretation affects our beliefs system since childhood, how fragile it can be, and get distorted in the process. Coach NANCY LEVIN provides plenty of exercises and examples to endure the inner work to eradicate the limiting belief of ‘being not enough’ that creates ‘having not enough’. Moreover, a couple of examples of how dealing with shadow work for self-worth around money spreads to other areas and resolves issues like an eating disorder and nail-biting that apparently weren’t related. I enjoyed reading WORTHY, and the awareness that these ideas provoke.